Breakfast served early, how did it taste? 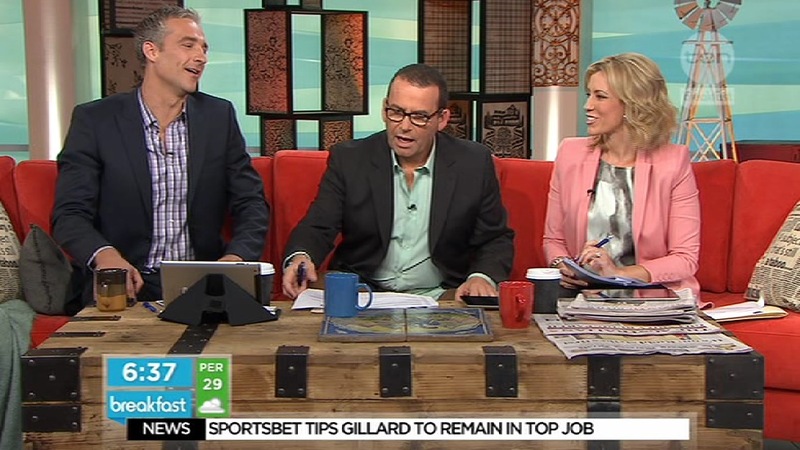 The Ten Network�served Breakfast�this morning ahead of its scheduled debut next Monday. The move to premiere the breakfast show early was made�in order to capitalise on the leadership crisis currently engulfing Australia following Mr Kevin Rudd�resigning as Australia’s Minister for Foreign Affairs. The program is fronted by NZ’s Paul Henry, Andrew Rochford and Kathryn Robinson, with Meteorologist Magdalena Roze�the show’s resident weather expert. The show opened with a nice and vibrant graphics package that really grabbed your attention first thing in the morning. It must be said that Breakfast’s graphics package grows on you and seems to engage you more compared with Nine’s recent makeover of Today’s graphics. The set is also an interesting one. �Whilst adopting the popular couch format the set is full of decorative pieces including a vesper and the heavy wooden ‘coffee table’ in front of the couch. It makes for interesting viewing but the jury is still out on whether it works for a breakfast TV audience. “It is Thursday the 23rd of February and it is game on, right now inside this seaside hotel in Adelaide, our Prime Minister…”. The opening to the program was certainty strong and directed viewer’s attention to the main story of the day and that this new program would focus on the major news stories of the day amongst other news, sport and entertainment coverage. Magdalena Roze, a former Weather Channel presenter, entered the program with weather news within the first minute. In fact the weather on Breakfast was one of the highlights of the show. The use of 16 large TV screens to present the weather added to her insightful coverage and is a key point of difference from breakfast TV shows on Seven and Nine, which use weather segments in the news to be more about finding an entertaining story on location that actually focussing on the weather front and centre. This of course changes if a major weather event is on the doorstep. The program also tried to separate itself from its competitions by delivering new segments such as ‘news by numbers’ and the use of an iPad on the big screen. An interesting introduction to the format was the ‘Henry Hotline’ giving viewers the chance to call-in, much like �on Sunrise a few years ago. 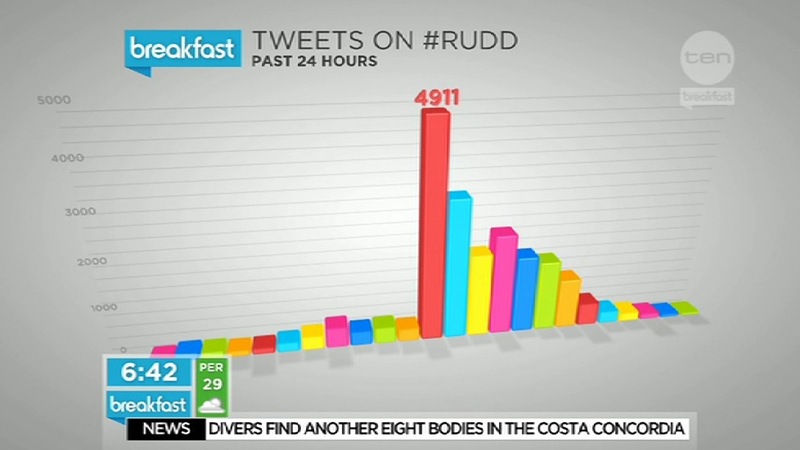 This gave the program a ‘radio’ breakfast show feel and was obviously an attempt to engage the viewer further in the program.�Andrew Rochford also introduced us to graphs tracking tweets on Twitter using the #KEVENGE or #Rudd over the last 24 hours. The other ‘new’ segment was called ‘the Buzz’ where resident politicians had 30 seconds each to give their view on anything – this felt very much like Sunrise’s discussion with politicians on a Friday morning. The show also came out of the blocks with a number of live crosses including to Ten’s Political Editor Hugh Riminton and many other guests/contributors on its first day including Tony Abbott, Bruce Hawker, Julie Bishop, Doug Cameron, Tony Burke, Tim Burrows�and Nicola Roxon. �This was a positive for the new show. You cannot judge a panel-based show purely on one outing, the show needs time to grow, in much the same vein as The Project. 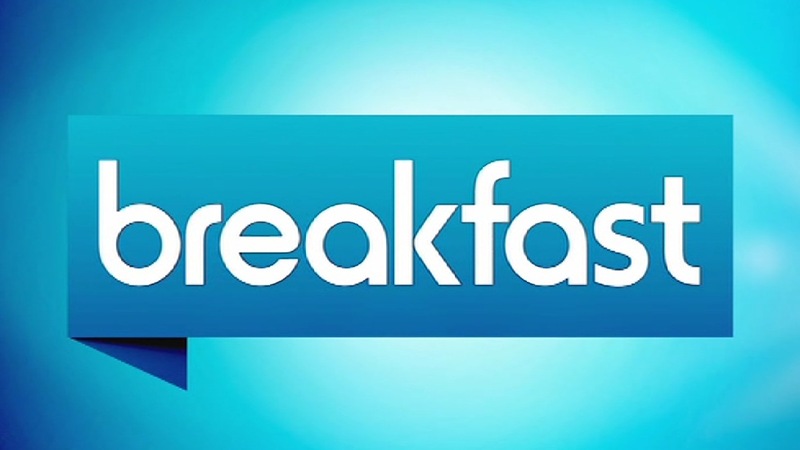 Breakfast has some good elements to it and is trying to inject something fresh into the Australian television market, but of course this will not come overnight. However with the show launching early to cover the leadership crisis, it should have really gone LIVE into all markets with the press conferences. Ten missed the mark in this respect. Morning viewing is about routine and Ten will need to work hard for viewers to change their morning diets. �The ingredients are there and it is now up to the show to work on its recipe to come up with a winning taste. TEN misses Gillard live into Qld, SA, WA.